Goal: publish the readings of the DS18B20 temperature sensor connected to ESP8266 to the flespi MQTT broker via secure MQTT over SSL connection. 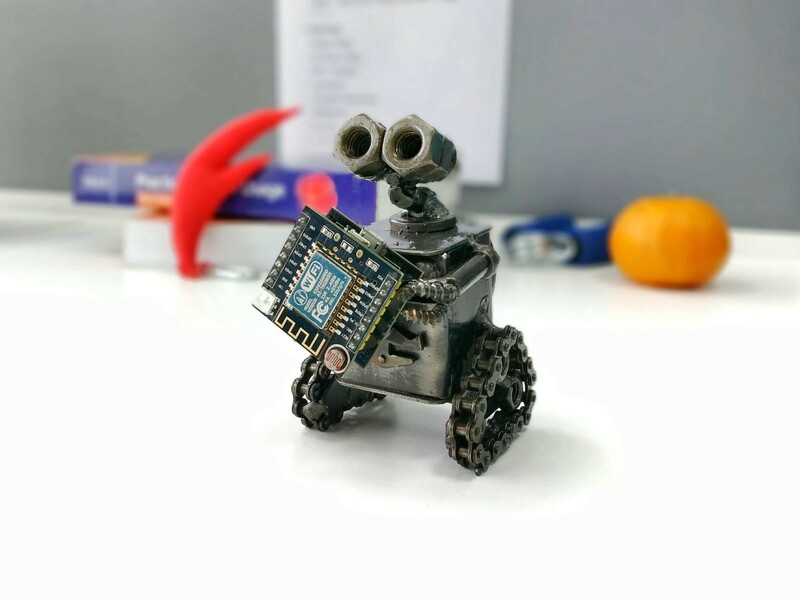 Way 1: Create a C-like code from scratch using Arduino IDE — in this case, we manage complexity on every level of development. Each way has its pros and cons, so let’s explore them! How to flash the ESP8266 board? How to read data from a DS18B20 sensor? How to securely send data to the MQTT broker? Different developer groups have already solved these tasks. We just need to put these blocks together. board profile: bootloader type, memory size and type, peripherals etc. compilation instructions: SDK, packages, libraries etc. IDE compatibility tools: flashing scripts, tests, examples etc. Everything is open source with more than 200 contributors. If something goes wrong, you can dig it right to the origin! Adafruit_MQTT_Library to establish MQTT over SSL connection. Here is the project for Arduino IDE. temperature.h includes the code to read data from the 1-wire sensor, and adafruit_mqtts.h includes the Adafruit functions for MQTT over SSL connectivity. 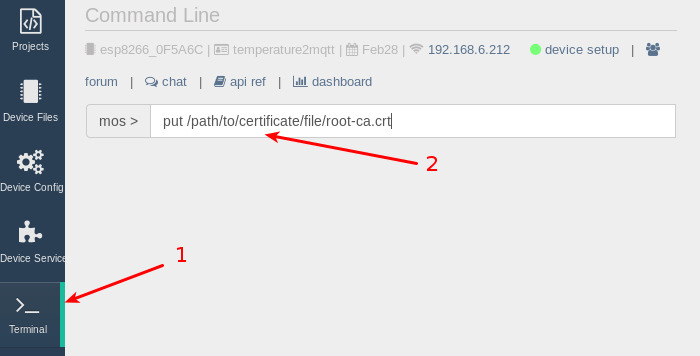 Note: to connect to MQTT broker via MQTT over SSL with Adafruit library you need to get a SHA1 fingerprint of flespi.io certificate and use it to establish a connection. Install and set up IDE. Even with all the GUI tools, Arduino IDE has one need to understand how to include new hardware type, import libraries, use serial monitor, find the port to flash the board etc. Work with third-party libraries. Of course, Examples cover many cases, but if you need to step away, you have to know where to find and how to work with the code from third-party libraries. How to find suitable methods, how to use standard Arduino IDE libraries and many more. Write the code. Even for such an easy example, you have to understand each line of code to make it efficient. Moreover, implementing this code to another project may require additional development efforts. Conclusion: this approach requires substantial knowledge of the behind-the-scenes stuff. But it gives you the maximum level of control and flexibility. how to download libs, device profiles, and organize the project. And we get the same result as with the first approach. What is the trade-off for the user-friendliness? 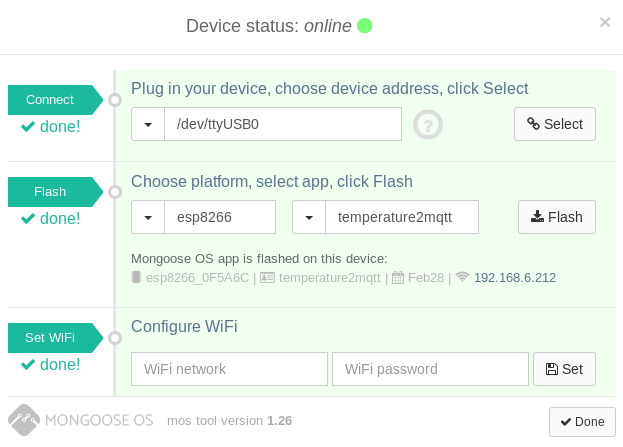 You will have no idea about how ESP8266 connects to Wi-Fi and to MQTT broker via a secure connection. Conclusion: you won’t have full control and understanding of what’s inside the black box, but it’s easy to set up and deploy, and you don’t spend time on development. The two approaches we discussed above resemble Wialon and flespi. On the one hand, you have Wialonwith hundreds of supported protocols, many useful applications, and a feature-rich interface solving dozens of tasks out-of-the-box. So if you don’t have a pressing need or resources to get your hands dirty with coding, it is an excellent solution for you. On the other hand, you have flespi with extended well-documented API, logging of all events, and manageability of all connections. 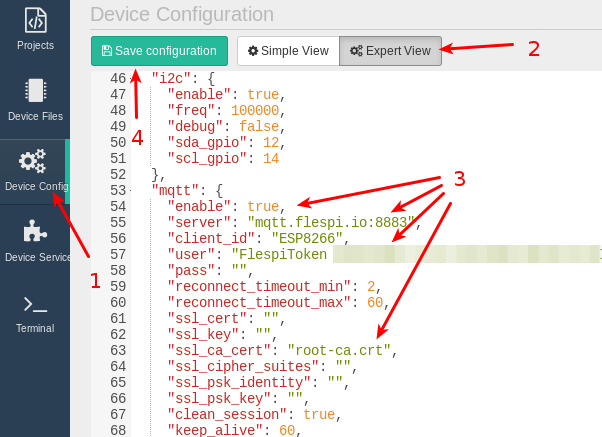 You can dig deep and have the full understanding of what’s going on with your flespi-based application from a tracker connection to the API error codes. It does require certain development efforts on your side and understanding of the underlying processes, but we will deliver all the major infrastructural components. how to support 50K active connections from tracking devices per single IP:port. Think about flespi as of a telematics module that works. We will take good care of the internal complexity and leave you an easy part. flespi is a PaaS solution for easy development of any location-based applications for businesses involved in fleet management, GPS monitoring, car sharing, etc.